Fishermen familiar with the waters off Hua Hin said that in the last year there have been an increasing number of large sharks in the sea off Hua Hin. And an abbot has issued a warning after video and still photography showed sharks circling in the sea off a temple in the area where a Norwegian tourist claimed he was attacked. Video footage - deleted but now obtained by Thaivisa - showed a Norwegian man being carried to a pick-up to be taken to hospital after what was said to be a shark attack at Sai Noi Beach in Prachuap Khirikhan. He had a bloody wound to his left foot. Doctors suggested that it was caused by a slip on barnacled rocks but fishermen in the area expressed no great surprise that it may be a shark attack that would be a first for the area. Phichet Wongkai said that a year ago he had caught two bull sharks in his net each weighing 30-40 kilos, reported Manager. Since then he said fishermen had seen sharks in increasing numbers in the waters off Hua Hin. He was shocked one had bitten a tourist but was hardly surprised suggesting that they were coming in closer to the shore to feed. For Phichet it was not a question of IF it was a shark but WHAT KIND attacked the tourist. In light of the shark attack claim the abbot of nearby Wat Tham Khao Tao added fuel to the fire. Phra Khru Bunyaphiram said that sharks had been coming close to the temple more and more recently. On Monday he took a video of sharks circling. He was not able to confirm that it was a shark attack but he called on the authorities to act fast in the light of the evidence. Sophon Thongdee of the Department of Coastal Resources said he could not confirm or deny if it was a shark attack yet but assured the public that his department were acting with urgency. A survey of the area was planned for today, Tuesday, with experts in a speedboat looking into the matter. Sophon said that if it was a shark attack it would be a first for the area. 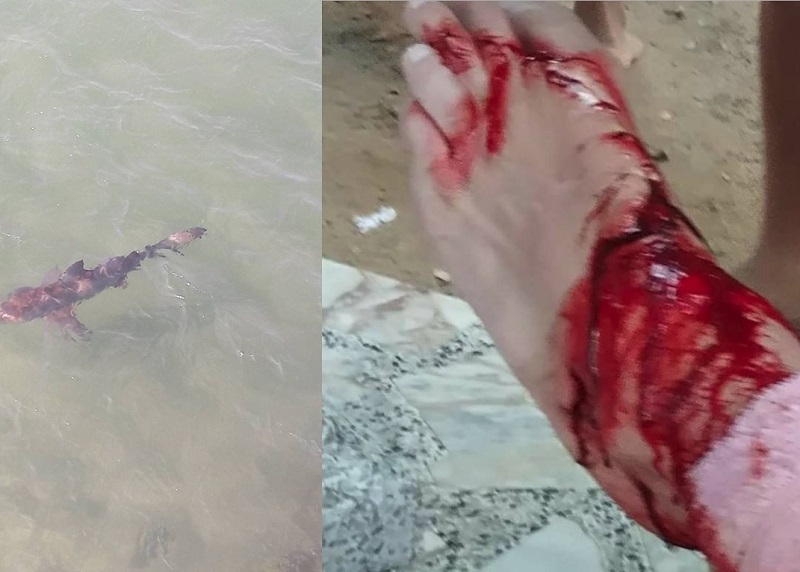 Hua Hin fisheries representative Amnat Fakteuan also suggested that it was too early to say but intimated that the evidence was mounting that it was indeed a shark attack on the tourist. No one has yet quoted the tourist about what he saw or felt. Stupid shark! Does he not realise he is showing Thailand in a bad light and could affect tourism. Come on, give us a wai, promise not to do it again and it can all be swiftly forgotten. What have speed boat experts got to do with a shark attack ? Slipped on barnacles, not even plausible. Didn't some Doctor come out the other day saying the wound was not consistent with a shark bit, well I would say that Doctor now qualifies for the title "quack". Good on the Thai locals for helping the guy out with a lift to the hospital, great stuff !!! Didn't some Doctor come out saying the wound was not consistent with a shark bit, well I would say that Doctor now qualifies for the title "quack". Just because a doctor said it, does not mean it is correct. Doctors are human, and sometimes get things wrong. A doctor told me after my accident you will be walking again in 8-12 months. A doctor gives his "expert opinion" based on his medical experience and education. That does not mean he is always right, it means he is more often right than the average person. In this case the doctor should ask himself if he has any knowledge about shark bites or barnacle slips. If not, he should have been smart and kept his mouth shut. ran it by an emergency dept doctor i know. unless you have experience treating shark bites and know what they look as opposed to other mechanisms of injury may not know. the international shark attack database only lists thailand as having a hand full of attacks very few doctors will have ever seen what it looks like. People forget.. that where there are dolphins there are sharks. they co-exist for same reasons.. and this region all they way down to Songkla the pink and white dolphins are known in this area so why not sharks. Just hope there is not a mad rush to kill every shark in the sea just because of this incident. The wounds in the pic are very consistent with a shark bite. Any warning to tourists or more likely the usual all-clear signal from the spin doctors at the TAT, or are they still suffering from a severe Songkran hangover? Looks like a bull. Enjoys shallow water and the occasional tourist snack! Keep clear if they are around. Tell your friends.